“The Svaldbard Doomsday Seed Vault” celebrating five years becomes increasingly important to the world. This year marks the fifth anniversary of the Svalbard Global Seed Vault in Longyearbyen, Svalbard. The vault was Norway and Microsoft founder Bill Gates’ gift to the world. It contains copies of seeds from more than 1,400 international gene banks. The world-famous seed vault, often referred to as “Noah’s Ark” and “the Doomsday Vault”, currently has more than 750 000 distinct seed samples stored in the permafrost inside the Svalbard mountains. – Today, we are 7 billion people. In 2050, we will be more than 9 billion here on Earth. In the coming years it will be more difficult to provide enough food to the world’s growing population. Climate change makes it more difficult and expensive to produce food. It is in this context that the seeds stored in the Svalbard Global Seed Vault will play a crucial role in the future, said Minister of Agriculture and Food, Trygve Slagsvold Vedum. (article continues) The seed vault in Svalbard has the greatest variety of seed samples in the world, and far inside the mountain nearby the airport in Longyearbyen, seeds from the world’s food crops are saved for future generations. The vault consists of three caverns each holds 1.5 million seed samples. The temperature is constant at minus 18 degrees Celsius (-0.4 Farenheit), and the vault has an infinite lifetime. The seeds may only be used if the original seeds for some reason are lost. 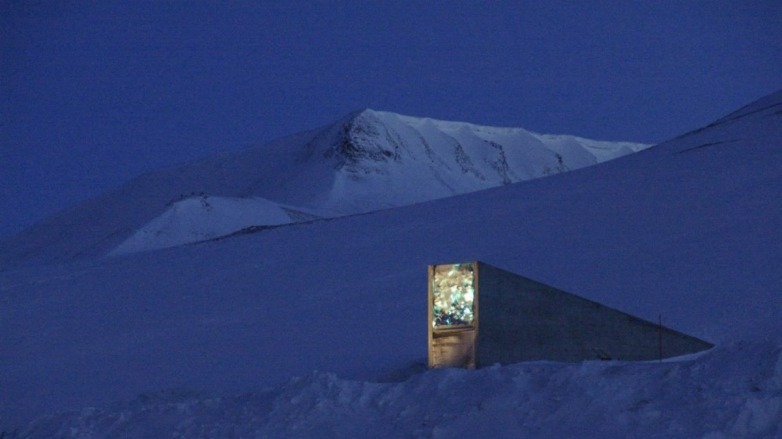 Thus the seed vault works as a safety net, so that the world’s gene banks can be rebuilt using seeds from Svalbard. Svalbard was considered particularly suitable for this purpose because of its extremely isolated location. Yep, Monsanto and DuPont needed some place to store all those GMO seeds.